Another unique building on the Grand Stand is the North Hampton Tower in Kingston Plantation. Expect a combination of multiple floor plans (40 in total) along with two-story townhomes expertly incorporated in the building. 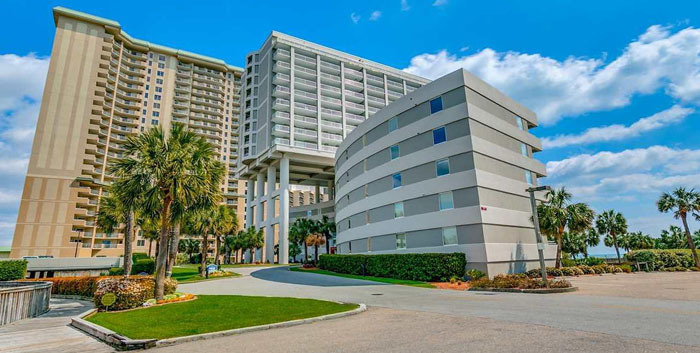 The building has a total of 17 floors and provides a fantastic view of the oceanfront. There’s also a "Hampton Club", complete with separate elevators and a private access area. The area is strictly for owners and prohibited from rental occupants. The section features units complete with three baths, two large bedrooms, and a den. Other units have three bedrooms and four baths. Townhomes are located on the first four floors in the Wave section as well as the 17th and 18th floors. North Hampton also offers an indoor pool, a hot tub, and outdoor pool complex. Residents and guests alike are also granted permission to access pools at the Embassy Suites Hotel. Those looking to own and rent their condo can grant access to the Splash pool complex to their guests also. For a complete description of all of amenities, pools, and a map of this fabulous resort, see our main page for Kingston Plantation Condos. Better yet, call us and see what a vacation condo in Kingston Plantation looks like!